Excavation of 150,000 CY coal tar contaminated soils in a residential neighborhood and adjacent to a public school maintenance facility. Project performed under temporary, mobile enclosed fabric structure 190 lf by 230 lf by 60 ft high. Sevenson installed an air handling system (600,000 cfm with 100 hp motor) to eliminate all vapors, odors and potential releases to the neighborhood community. Installation of permanent low permeability steel sheet pile wall along the perimeter of historical on-site building 400 lf by 30 feet deep. Installation of a temporary WWTP sized at 250 gpm to treat all on-site excavation waters. Over 12,000,000+ gallons of water was treated and discharged to local POTW. Installed eight (8) temporary interior steel sheet piling cells as protective shoring for deep excavation. Over 3,000 tons of sheet pile installed. Construction of a noise reduction enclosures (to encompass the sheet piling vibratory hammer) to reduce noise level during sheet pile installation. Community relations was an important component of this project. The Court Street site is located in the City of Ithaca, New York. NYSEG’s predecessors operated a coal gasification plant from 1853 until 1927. The plant occupied approximately one-half of the block in this residential community. The Former Manufactured Gas Plant (MGP) is a 4 acre site owned by the Ithaca Central School District. The property contains the Ithaca school districts maintenance buildings and central receiving office. Also situated on the property is the historic landmark building called Markles Flats. The site is in direct proximity of the public elementary school, private elementary school, community center, Ithaca public pool as well as a residential neighborhood. Sevenson was awarded these contracts on a competitive bid basis. 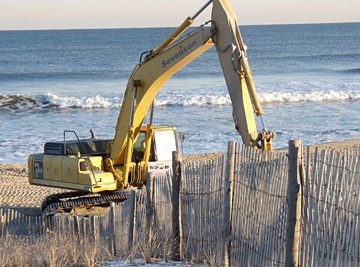 Operable Unit 1 was conducted in co-operation with NYDEC Voluntary Clean-up Programs. The project involved several remedial construction work tasks which required close coordination and scheduling with the Ithaca School District. Remedial action began with site preparation work. All utilities (gas, electrical, water and sewer) were relocated. 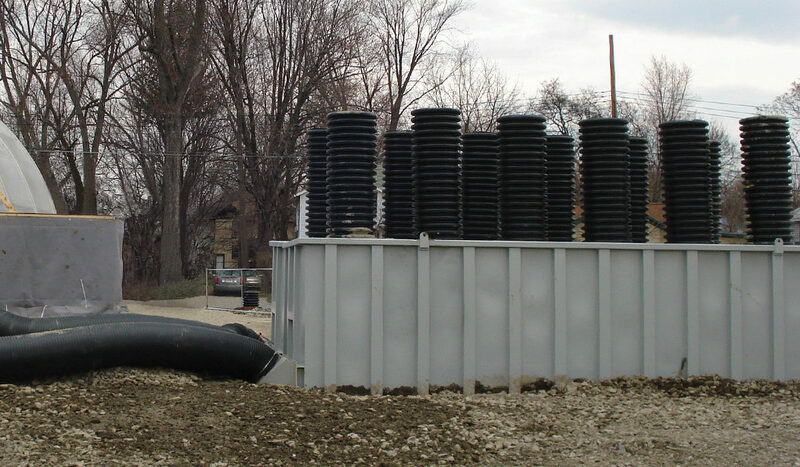 Phase 1 required the excavation and removal of coal tar contaminated soils from below grade duct work and piping to depths of 12 feet in the city streets adjacent to the site. Excavated materials were characterized and segregated for either onsite use as backfill or stockpiled for shipment offsite for disposal. Excavation occurred within a residential neighborhood. As the excavation progressed all utilities serving residences in close proximity to the excavation areas were disconnected and reinstalled in the same work day to minimize any disruption to the residents. This process required quick turnaround for sampling and analysis. Restoration included placement and compaction of approved backfill to grade, restoration of asphalt, sidewalks and curbs, and topsoil and seed. 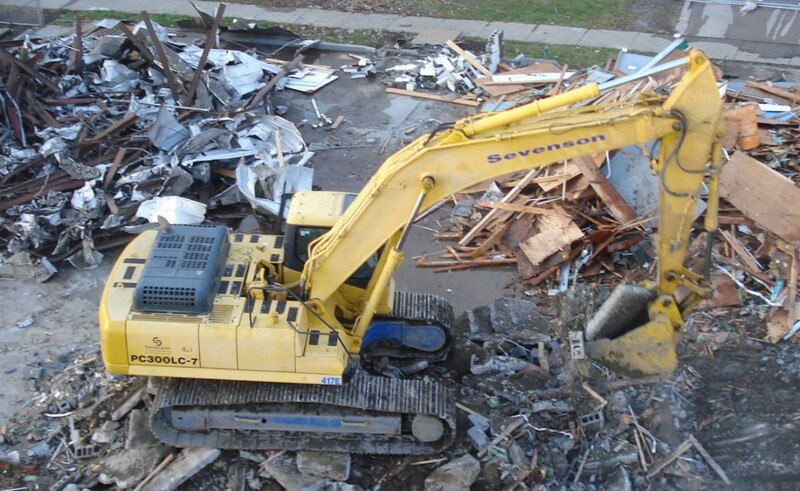 Remedial action required Sevenson to demolish 32,000 sf of Ithaca school district maintenance buildings and the former MGP gas holder pads and foundations. 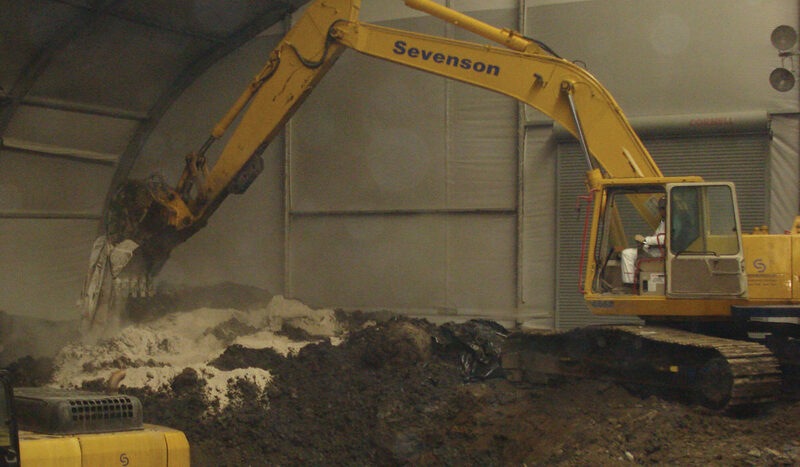 Sevenson installed a 250 GPM temporary waste water treatment plant to treat all water generated during construction and demolition activities. The system was housed within an insulated structure to allow for water treatment activities to run continuously during winter months. 2,000 lf of cantilevered 54 feet sheet pile was installed for excavation support and to cutoff ground water infiltration. A temporary fabric structure was constructed which included an engineered air handling system for all excavation activity. In addition, a temporary cut-off wall around the perimeter of the Markles Flat historic building with permanent ground water extraction system and a 15 gpm permanent WWTP was installed. Clean fill was transported to site and placed in lifts compacted 1 ft below grade. Topsoil was added for final cover at elevation. 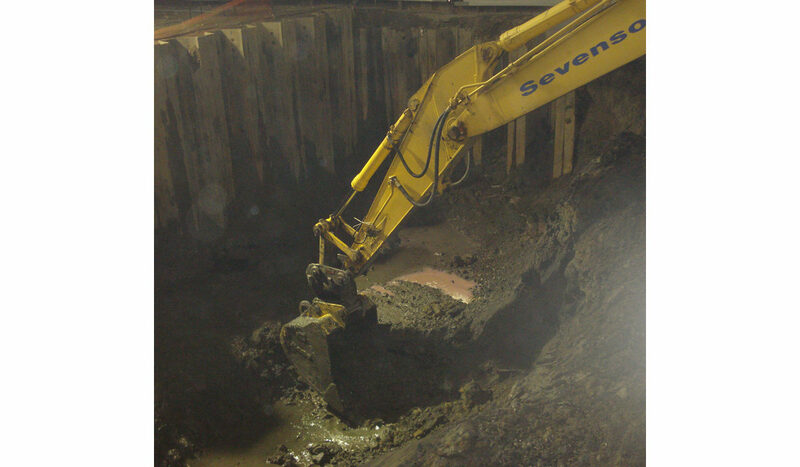 Prior to initiating OU 1, Phase 2 remediation activities, Sevenson relocated a 10 inch high pressure gas line traversing the site in close proximity to the structural sheet pile area, relocated storm sewer catch basin and drains, and placed structural protection encompassing fiber optic lines. Phase 3 remedial action required the decontamination and demolition of an additional 3 story building as well as the excavation, characterization, T+D of MGP impacted soils. 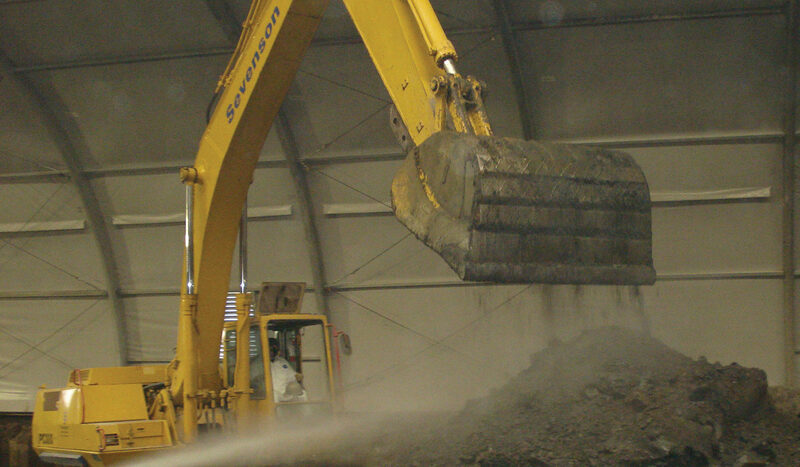 Excavation operations continued within a temporary fabric structure which included an air handling system. An excavation support system consisting of a steel sheeting system was installed in 3 separate areas of the site. A WWTP sized at 100 gpm was installed to treat all water generated from remediation operations. Extensive restoration included backfill, asphalt paving, concrete flatwork and landscaping. All three phases of work required a variety of excavation support systems. All were constructed utilizing steel sheeting. One challenging installation required 2,000 lf of AZ-48- 54 feet sheet pile in cell configurations of 85 feet by 125 feet. A cantilever design was chosen to allow free unobstructed excavation to the depths in all areas of the cell. Since the site was located in a dense suburban area, Sevenson utilized a variable moment pile driving hammer. This hammer continuously adjusted to the driving conditions of the soils. This reduced noise and vibration. Pre-drilling along the sheet pile line and backfilling with sand to a depth of 54 feet was done to break up the density of soils and reduce vibration. Predrilling and for discovery of obstructions and removal prior to sheet pile installation to avoid costly down time. Because of the community sensitivity to the noise issue during driving Sevenson installed a hanging sound enclosure suspended from a crane which surrounded the sheet pile section driven. This reduced noise levels to the adjacent schools and neighborhood. Seismographs were positioned in 5 locations around the site with continuous real time data availability. MGP- impacted soils and structures were excavated to a specific depth or to an elevation of a competent defining clay layer for visual inspection of bottom. 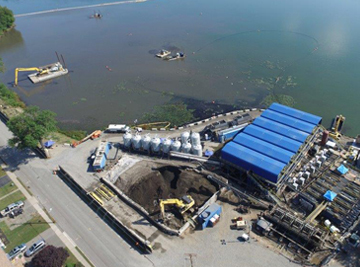 All structures including a 100 ft diameter intact gas holder encountered during the excavation were removed and sized, and sent off- site according the requirements of the treatment facility. Excavated soils were amended with LKD (less than 50% calcium oxide, NYDEC regulation for working within a structure) to reduce the moisture content down to less than 18% which is acceptable for thermal treatment. Excavation quantities of MGP impacted soils totaled 150,000 cy. Offsite disposal of impacted concrete and debris totaled 15,000 ton. 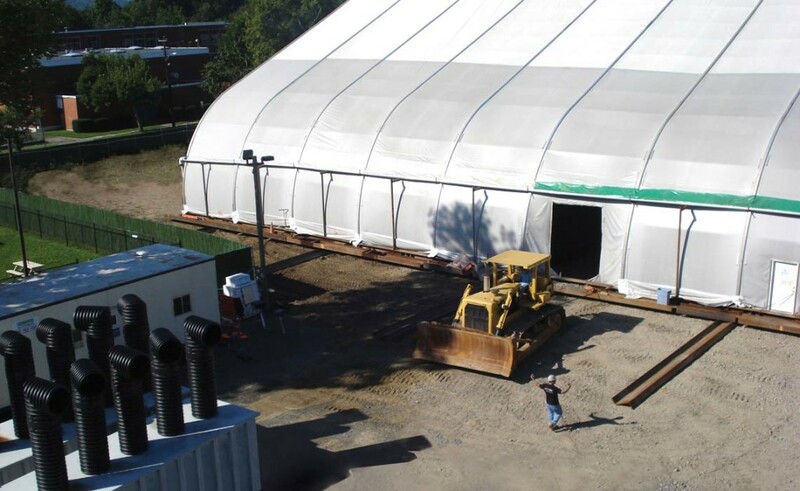 100% of excavation occurred within the confines of a temporary fabric structure. The structure was equipped with a carbon system consisting of a 100 horse power blower and fan, two carbon vessels loaded with 15,000 lbs. of activated carbon to achieve three complete air exchanges within the structure per hour. Trucks entering the temporary structure for loading and transportation were directed into an isolation chamber to allow tractors to stay within a clean zone during loading. The temporary fabric structure was relocated 8 times over the course of excavation operations. The building was constructed on an independent engineered steel frame and skidded into place over the next cell to be excavated saving time versus a tear down and reinstallation of the structure. Imported back fill material was placed and compacted in each cell to final grade elevations, steel sheet pile cells were removed, decontaminated and demobilized from site. The property has been returned the City of Ithaca School District for future plans of a possible recreation area for their students and a warehouse building for supplies related to district activity. 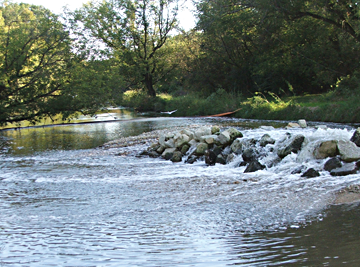 Unique Characteristics: This project involved both volatile and semi-volatile organic material at high concentrations. Work was done inside of a Sprung Structure equipped with a ventilation system. The site was located within a city block with two (2) schools located on either side of the perimeter. Both fence line and strict monitoring was conducted to determine whether there was any impact to the community. During the course of the project there were no exceedances of prescribed airborne action levels. Health and Safety Measures: Real time air monitoring was continually conducted at the active work areas. Action levels for worker protection were established, and the level of protection from D Modified to B.